Mango. Definitely. You’ve walked into an early-spring garden in the South of France giddy with the plumes of fluffy sun-bright mimosa puffs, their powdery anisic scent carnal and fresh as a young cheek… And stumbled into a mango grove on the other side of the planet through some scented wormhole. Mango, with that slippery powdery feel the fruit has when you chew it: wet, a little milky, with a touch of green. Isabelle Doyen has somehow insinuated a sly olfactory joke in her latest soliflore for Annick Goutal, and her mimosa comes out grinning. Especially since it’s in good company: not quite a soliflore then, since after the mango surging from the green vegetable facets of mimosa absolute – there are always leaves and twigs mixed in with the flower when it is treated --, a goodly dose of iris shows up to draw out its more serious, cardboard facet, along with a violet-like candied puff. As the scent dries down, it slips into the vanillic sweetness of guaiac wood, which picks up the powdery pompon softness of the flower and sets it down on the smoky milkiness of sandalwood. Mimosa isn’t a complicated fragrance: it’s got just enough surprises to keep you entertained, and the good-natured joyful sensuality of a Renoir model, sweet flesh bursting with health and promise. Only this one has packed her bags and she’s off to the Antilles. Thank you for the review. Now I want to try it even more. I like the scent of mimosa. I wish for a nice rendition of it in a perfume. In Amarige Mimosa it's more Amarige then mimosa. And in Calypso Christiane Celle's Mimosa it's too linear and simple even though on the notes list for this perfume mimosa has a nice company. I know about at least couple more choices I have in my quest for a perfect mimosa perfume and I have high hopes for AG's one. Undina, I've never really explored the range of mimosas. Another one I found lovely was the Kenzo Summer, which is less about fruit flesh. Mimosa perfumes are beautiful when done well, must try this. It seems to me that mimosa is a difficult floral to work with, and so often, the note comes out with either musty or urinous tones. I don't know if there is any synthetic mimosa out there. It's interesting that she brought out the green facets via mango, most noses seem to go for the honey, or pair it with almond. I tried one a while back that was paired with marigold (genda/tagetes)- that was a nice twist! Marla, mango is a kind of chimera here: I'm not sure that's exactly what Isabelle went for, but it kind of happened between the lactonic and green notes (violet leaf and a synthetic called florhydral) that conjure an aqueous effect. Tagetes would be an interesting addition. 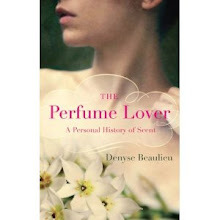 From your description this sounds like a perfect spring perfume - it still feel like winter here, but I'm jumping the gun as regards perfume and prepping my springtime arsenal. Will have to try this one out when I'm next in London; it sounds v different from UFdC, which is the only mimosa I'm familiar with. 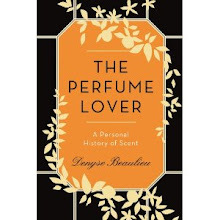 it sounds really interesting from your words, about me Isabelle Doyen is a great parfumeur and now I'm very curious about this fragrance, especially about its mango side. Mango! Oh, I love mango. You've just kicked this up my to-try list. Parfymerad, this is definitely not in the same category as the slightly brooding Une Fleur de Cassie: it's really quite cheerful and tender. Fragrancescout, it's interesting that niche perfumers are taking on fruity notes right now... They're showing us how it can done right. I look forward to your picture choices as much as your prose and this time you have outdone yourself! 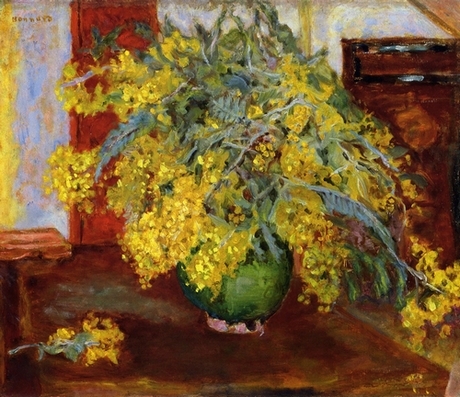 The first a simple still life depiction though with beautiful brush work the second at the other side of abstraction gives us not just the appearance but the expereince of mimosa.What makes you select particular images for the french/english sections? Thank you Maureen. There's no special principle that dictates different choice for the French and English sections, unless the "French" picture alludes to some aspect of the French culture which would be lost on a more international readership. It often takes me quite a bit of time to find two images that correspond to what I've written and to my personal iconographic tastes, so I'm glad they're appreciated. Now this is something that really gets my attention! Mimosa can be a little prim sometimes, but with the addition of mango, it ought to be quite lively, I look forward to trying this one. Flora, I'm not gaga over mimosa soliflores usually, but as you say, this one is quite lively. I tried it the other day and although I found it interesting and pleasant, i could smell (imagine?) fleetingly in the seconds following spaying but never ever after that. I was hoping that it would be for mimosa what "en passant" is to lilac. I think that I would have enjoyed that perfume more if it had been called something else, as the name suggests a promise it does not really keep. Columbine, it's true that sometimes soliflore names raise expectations of a certain idea we have of the flower... On the other hand, I can also see why a perfumer wouldn't want to go for a straight-up rendition if it already exists elsewhere (I haven't smelled L'AP Mimosa pour Moi recently but if memory serves it's closer to the real thing).